Please don’t think I have forgotten about the horror of harvesting organs. I came across this article and post from The Fifth Estate filmed about Canada but it is EXACTLY the same in the United States. In fact the United States was/is the leader and sets the standard for all other countries. In fact is was at Cleveland Clinic that first started using the Donation After Cardiac Death or DCD. Across the country, physicians involved in organ donation must adhere to what’s known as the ‘dead donor rule’. It seems simple – organs cannot be procured until after the donor has died. EPISODE SYNOPSIS : It’s a question you might think medical science would have answered long ago – when are you dead? But in “Dead Enough” the fifth estate explores how the standards for when and how people are declared dead can vary from province to province and even from hospital to hospital. Host Bob McKeown looks at how, in the rush to meet the need for life-saving organ transplants, some doctors are worried that we may be pushing the ethical boundaries. In the documentary Dead Enough, The Fifth Estate shares the stories of two families who both faced difficult decisions about organ donation, because their loved ones were not expected to survive severe brain injuries. When her daughter was critically injured and paralyzed in a car crash, for example, Sharon Thompson was at her bedside in a Calgary hospital around the clock. Thompson says she was approached to consent to organ donation, and asked to consider taking her daughter off life support. “When people are in an emotional state, I don’t think that’s the time to be asking those questions. Because the emotional roller-coaster we were on for, I would say, at least three of those six weeks … that’s not a great time to be having to make that decision too, because you’re not thinking,” she told McKeown. Thompson chose not to take her daughter off life support, and Brandice Thompson made a remarkable recovery. Shane Becker, in Vancouver, BC. His family was planning to donate his organs after the 25-year-old college student suffered a fall that severely injured his brain. When his mother arrived at the Vancouver General Hospital, she said she was told that her son’s brain would soon stop functioning, and he would not recover. As she was struggling with the news, she was approached by a hospital social worker. Donna Becker said she was asked to sign the organ donation certificate. “I just made a decision to do so knowing Shane would’ve wanted me to,” she told McKeown. But the decision to take Becker off life support had to be postponed. The family wanted to WAIT for his father, who had to drive from the BC interior to say his final goodbye. While they were WAITING, Becker’s mother, a nurse, noticed a tiny change in her son. 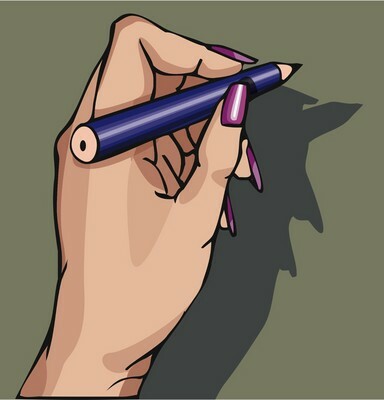 “When we were all holding his hand, he did, there was definitely some change in his grasp. It became a little stronger, especially when we spoke to him,” she told McKeown. Because they were waiting Shane Becker is now 32, married and a father. The debate over defining death has mostly been conducted in the medical community, out of public view. It is time to make the debate public. Excuse my sarcasm but good luck with that. Organ donation is a multi billion dollar industry. Please take a few minutes and watch this video produced by CBC/Radio-Canada. Listen to both sides of the debate. You may have to decide for one of your loved ones. Informed consent is critical to making the best decision for your loved one. Informed consent is given when the consented has an adequate understanding of the relevant facts, and voluntarily, without coercion, consents to some procedure. Shane, young, smart, strong athletic prime candidate for organ donation. Fighting to communicate with his family. Can you imagine what would have happened IF his dad had not been out-of-town and was traveling to get there to say his good-byes? 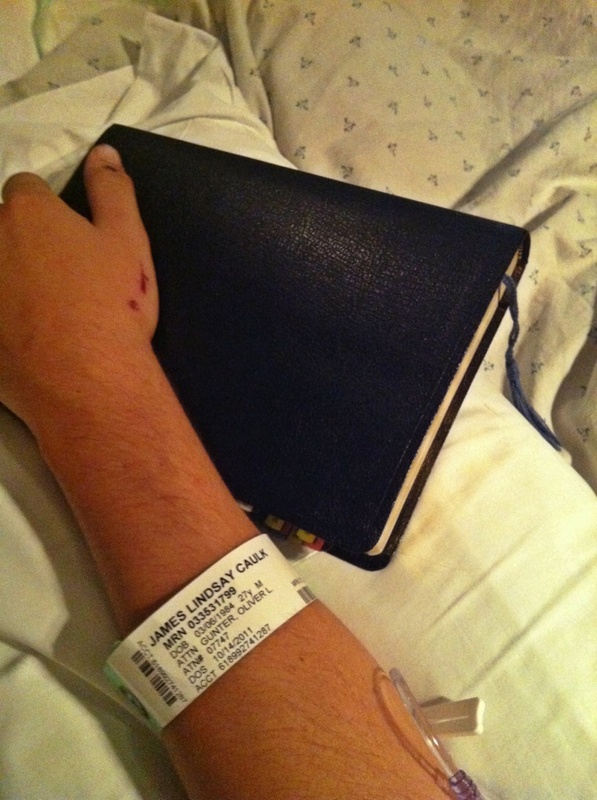 Oh God, my son Jamie let us know is so many ways he was fighting. And this is why I write and share because I don’t want anyone to not understand about brain death. 1) the lack of all brain functions does not correlate to the cessation of the functioning of the organism (us) as a whole. 2) An organism with a complete lack of brain function, if maintained on a ventilator, can nonetheless maintain certain homeostasis-maintaining biological functions, and so remain biologically alive. 3) Biological death is the event that separates the living (or dying) process from the process of increasing entropy. Entropy is deterioration, degeneration, crumbling, decline, degradation, decomposition, breaking down, collapse; disorder, chaos. 4) Early on in the brain death literature it was discovered that individuals can meet the diagnostic requirements for brain death in terms of apnea, unresponsiveness, and lack of cranial nerve reflexes, yet maintain certain neurological functions. This was further proved in a study by Dr. Alan Shewmon. 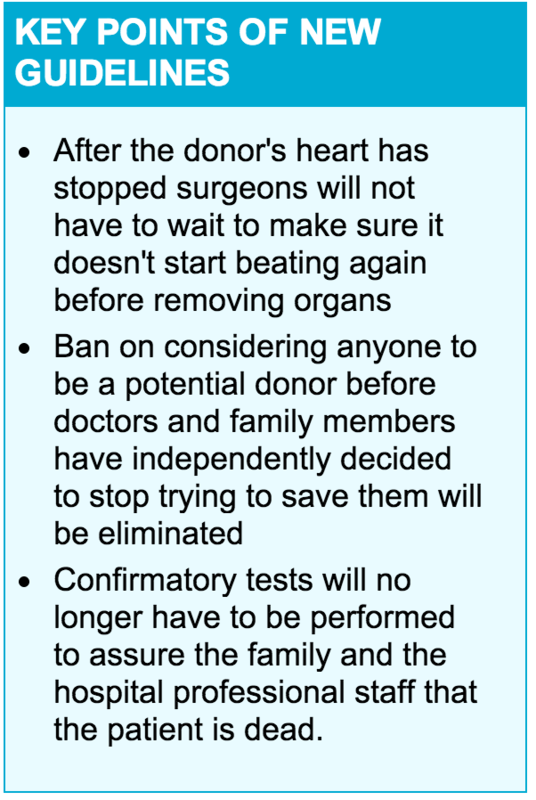 There are two ways to give informed consent to remove organs for those declared “brain-dead”. 1) Once you have been pronounced “brain dead” the physician, can ask your family members and or friends. 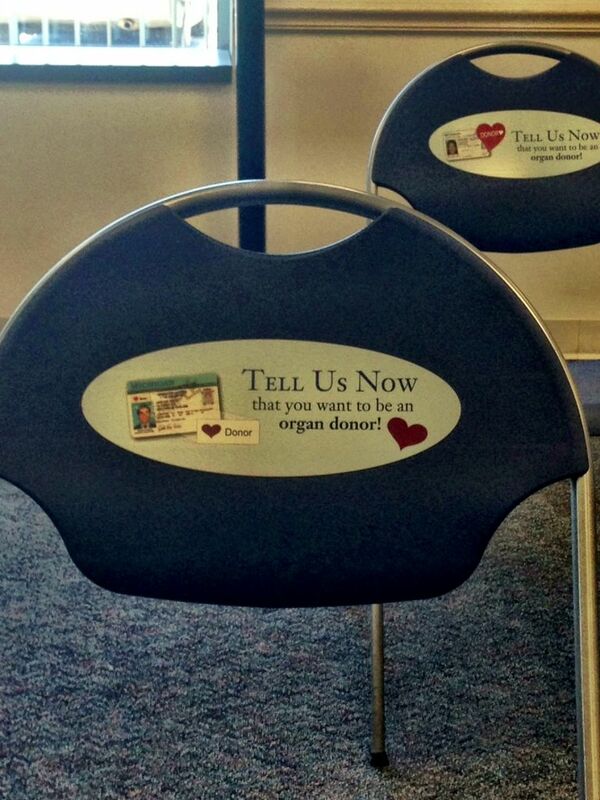 2) When you sign up to be an organ donor at the DMV, or Secretary of State. Unfortunately, each hospital has their own processes or protocols for determining a call of brain death. Think of your own area’s hospitals. As an example in Michigan, we have several hospitals that are Trauma 1 hospitals. 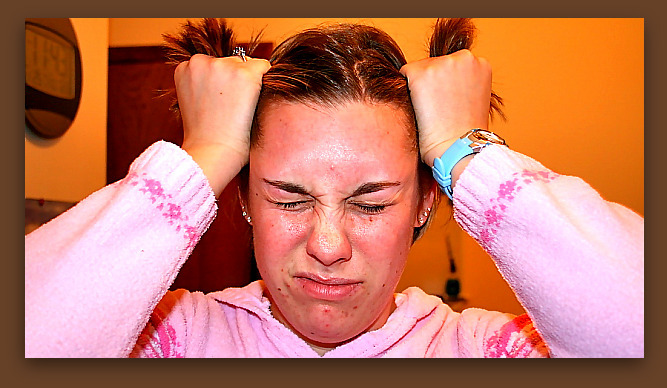 You could be pronounced brain death at U of M. by a nurse who can call it. But at St. Joes you may have to have two tests, 24 hours apart, at Beaumont you may need two physicians and a required EEG, at Detroit Receiving Hospital they may require a nuclear scan. 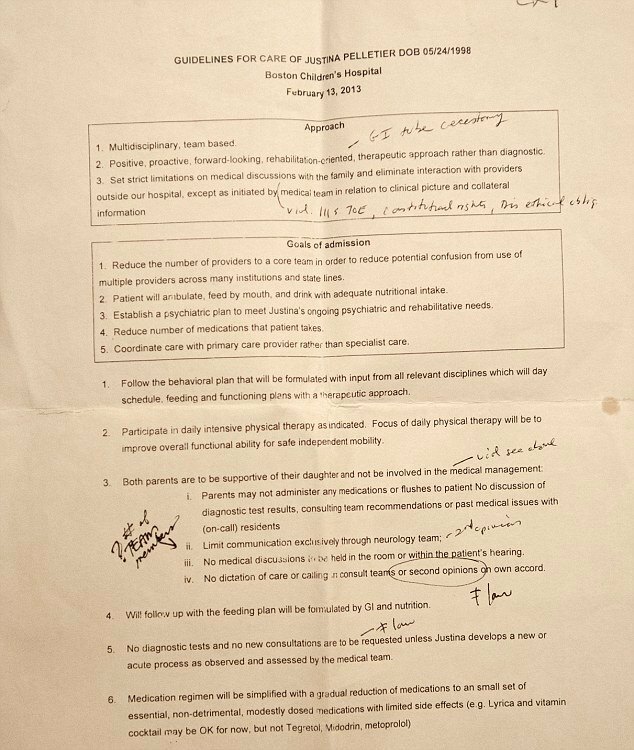 ( I have no idea expect for U of M just using this an example of how hospital have their own protocols. The difference is practicality you can be pronounced dead in one hospital and not dead in another depending on their protocols. Mike Nair-Collins, Ph.D. at The Bioethics Program at Mount Sinai School of Medicine in NYC, who is the inspiration for this post said, “consciousness, does not determine death”. Informed consent is achieved through a conversation between patient or surrogate decision-maker and physician, where the physician explains the relevant facts to the decision-maker. For the conversation to result in the successful communication of information, both the physician (the speaker) and the decision-maker (the hearer) must play their respective communicative roles appropriately. For the physician, that means that they must understand her own subject matter before they can communicate that to the hearer. Unfortunately, many physicians do not understand the conceptual difficulties, inadequacies, and fallacious reasoning surrounding the brain death doctrine. I make this claim on the following four grounds. First, the literature upon which the brain death doctrine is based is riddled with non-sequiturs. Discussions of critical vs. non-critical functions are irrelevant, consciousness is a red herring, as the difference between life and death is not the presence or absence of consciousness, there is confusion between diagnosis and prognosis, the creation of various homonyms distorts the issue and obscures the underlying value judgments, and there is confusion between the normative questions about organ donation with the factual questions about biological life and death. We can hardly expect that great clarity will arise from such a confused primary literature, and it is no surprise to find a lack of understanding about death, brain death, and the relations between them. As a result of our acceptance of the dead donor rule, and as a result of the legal definition of ‘death’ in terms of brain death, the physician, as Miller and Truog note, must insist that brain death equals death. Thus, the physician must inform the family member that her loved one “is dead”. But what does that mean, since there are at least six different homonyms, all of which are spelled, and sound like, ‘dead’? I have written recently on the study of physicians who pronounce brain death. Presumably the family member will interpret ‘dead’ in the common sense use of the word. Whatever other connotations might be involved in the word ‘dead’, some version of the biological concept, of cessation of functioning, clearly lies at the core of the common-sense concept. On the biological concept, and hence on at least part of the commonsense concept, the brain dead patient is still biologically alive. Therefore, the decision-maker does not have adequate understanding of the relevant facts; namely, the decision-maker is misinformed about whether the brain dead patient is biologically alive or not. 1) Physicians try to explain something that isn’t true. 2) The family member tries to understand a concept called brain death, but they may be thinking of the homonym word death and not understand that their loved one is STILL biologically alive. 3) When a doctor tells you your loved one is dead, you are NOT thinking of a legal, clinical determination but dead in the common sense, or the historical sense of the word dead. 4) This is one reason Organ Procurement agents are used the majority time because they learn scripts and dialogs and are rewarded when they meet their quotas. Is Informed Consent Really Informed? From a study done by Woien, S., M.Y. Rady, J.L. Verheijde, and J. McGregor, “Organ procurement organizations internet enrollment for organ donation: Abandoning informed consent,” BMC Medical Ethics 7 (2006): 14, they determined that out of the 60 OPO websites they looked at that there was NO reliable information on the organ donation process. Our findings showed that the disclosure on OPO Web sites and in online consent forms lacked pertinent information required for informed enrollment for deceased organ donation … The Web sites predominantly provide positive reinforcement and promotional information rather than the transparent disclosure of the organ donation process. 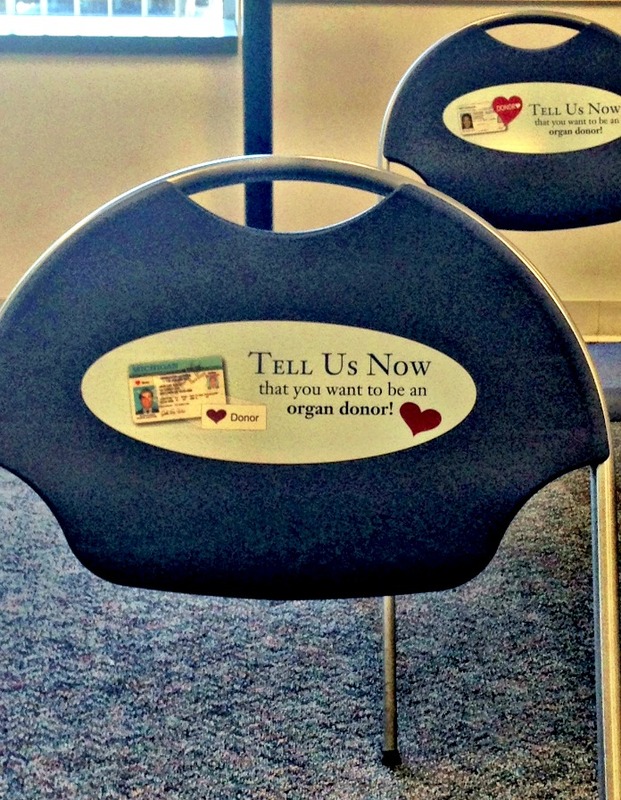 People need to be able to make informed consent BEFORE signing to be an organ donor. They need to be able to understand that brain death is NOT the biological death of the person. Organ harvesting from the brain dead donor kills the donor. That is the fact, and if people are informed and still want to donate that is their choice…as long as they understand that brain death is not biological death. Killing an individual to get their organs without informed consent is a moral violation both to the donor and their families who have to make that decision. The public has been lied to, not informed and intentionally deceived by the medical community. Biological science is what it is, whether we like it or not. With an agenda like that at the outset, the data could be made to fit the already arrived at conclusion. It seems that there was a serious lack of scientific method in this process. The entire paper by Michael Collins can be read: Death, brain death, and the limits of science | Mike Nair-Collins – Academia.edu. Parents have no say if the child signs the organ donor card. I tried to tell you in a post written a few months ago that if your child or loved one is critically injured you have no say in refusing to have their organs harvested. A case in Columbus, Ohio reveals a recent example of this. A 21-year-old Columbus man who had been declared legally dead but was on artificial life support had his organs harvested under court order yesterday over his family’s objections. You can read the story here on the Columbus Dispatch. Minors if eligible under the law are embowered to be a donor. If the minor donor dies under the age of 18, it “seems appropriate that the minor’s parents should be able to revoke the gift.” However, the minor’s parents cannot revoke the anatomical gift if the minor donor later dies over the age of 18. In a state that provides that a license issued to a minor is good for five years and the minor applies for the license at age 17, the minor can make an anatomical gift on the driver’s license at age 17 and need not reaffirm the gift for another five years. Furthermore, once the minor reaches age 18, the minor’s parents cannot revoke the gift. The UAGA exhorted the Organ Procurement agents to stop the practice the practice of seeking affirmation (ex. from parents, added by me) when the donor who has clearly made a gift.This results in unnecessary delays in procuring organs and the occasional reversal of the donor’s wishes. How many teenagers understand that you are not really dead, when your organs are harvested? There are no brochures at the Secretary of State’s or Department of Motor Vehicles when you sign up to be an organ donor. It sounds altruistic, a good thing…but you are not informed that organs can not be taken from truly dead people, you are only given the diagnosis of “brain death” and no hope of recovery. We see from the recent story that hit all major news outlets this past week that a woman opened her eyes while laying on the table just as her organs were about to be harvested, that hospitals and doctors do make mistakes. What if that was your child? What if you wanted to overturn the fact that your child’s organs not be taken because they were not informed? After officials at Grant Medical Center notified Lifeline of Ohio of Smith’s wishes, Pamela and Rodney Smith said they didn’t want their son’s organs harvested. On Sunday, Pamela Smith, of the East Side, wrote to Grant and to Lifeline to say that the family did not consent to harvesting his organs because Elijah did not fully understand the choice he had made. Their precious child was cut open and died on the operating table as you are very much alive when your organs are taken, the heart being the last organ to be taken. Talk to your family members about what really happens in Organ Harvesting? 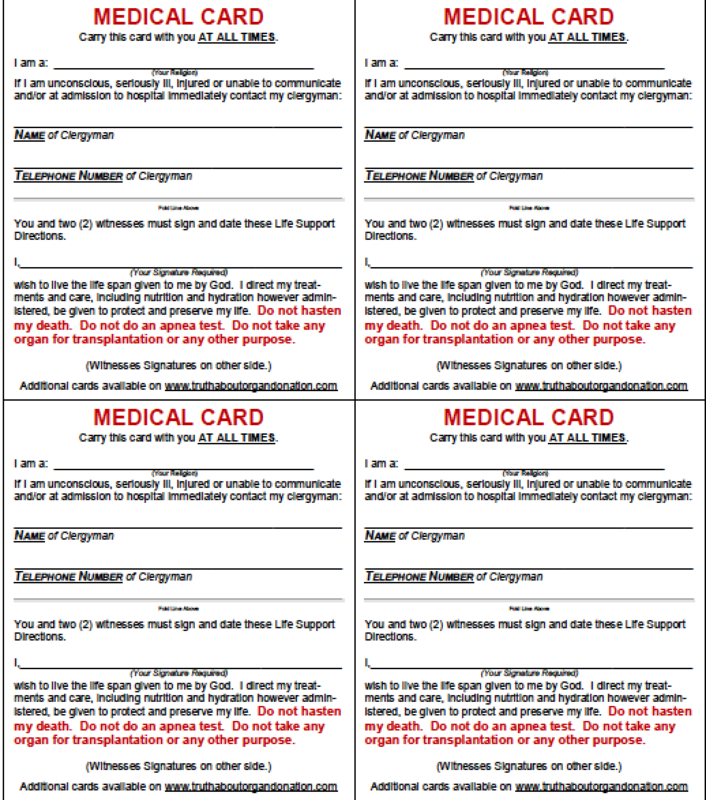 Download the card to protect and preserve your life, written by Dr. Paul Byrne of the Life Guardian Foundation. Send a letter of refusal to the Organ Registry in your state and any state you may have signed up in.